Tintamarre, or as the English called it "Flat Island", lies to the north-east of Sint Maarten. It is part of the French side of Saint Martin. There is a beautiful white sand beach and anchorage in the protected lee of the Island. There's good snorkeling for beginners in the shallow calm waters and without a doubt the cool tropical breezes make this an ideal stop. The Island is part of a marine reserve and therefore a strict principle of “Take only photographs and leave only footprints” is applied. We get on board at Boca Marina at 8:30am, which is the old Uncle Harry's Restaurant, opposite the airport runway on the lagoon side. Neil will have breakfast on board for you. Breakfast consists Baguette, Cheese, Cream Cheese, Yogurt and a platter of fresh fruit, Juice or Coffee. Celine Charters sail through the 9:00am bridge on the French side, and have a 2 1/2 hour sail up the Anguilla channel to the island of Tintamarre. We arive there around 11:15 am. At Tintamarre everybody relaxes. 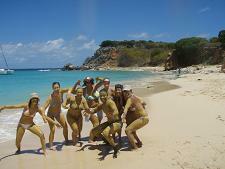 You can go for a swim or snorkel and the mud baths are a lot of fun. There is a place on the beach for clothing optional sunning and swimming for those so inclined. Lunch will be at approximately 1:00pm. It consists eafood Paella, Blackened fish, BBQ Ribs, Potato salad, Pasta salad and our special Greek green salad with fresh fruit and nuts, as well as our special herb garlic bread. In the afternoon, after we have finished lunch, we can have a last swim at Tintamarre and then sail to Creole rock. While at Creole Rock, we engage in spectacular snorkeling. Your snorkel gear is provided on board. After snorkeling we then head off to the nearby happy bay to do the mud baths. Happy bay is secluded and rarely has anyone there. We also do the mud baths at the back of the boat to accommodate non swimmers. Once back on board a platter of Pineapple, Strawberries and a selection of chocolates is served. We leave Happy Bay at 4:45pm in order to be back at the French bridge for the 5:30pm opening. Once through the bridge we do a little "frozen drink surprise". We will be back at the Boca Marina around 6:00pm. PRIVATE: The price is $1600 for up to 10 people, more than 10 people each additional person will be charged at $140.00 per person. 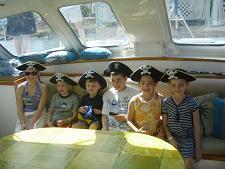 Day charters are available Mondays, Wednesdays, Fridays, Saturdays and Sundays. The party starts here. 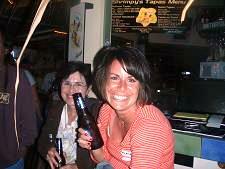 The original lagoon pub crawl by boat on St Maarten. The Celine is a 40 ft Catamaran with plenty of room for everybody. Famous for her sunset cruises the CELINE is now the premier party boat. 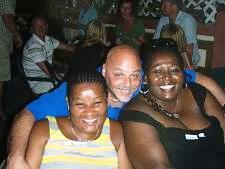 Visiting some of the best pub/restaurants on the Simpson Bay lagoon, this is a party night. At each port of call there will be a sampling of their specialty dishes. Our first stop is at the Crazy Cow restaurant where we will have our starter course, and a welcoming drink (all drinks are "well drinks"). Our next stop is at the Four Winds, in Port of Cupercoy, you can choose from a choice of Beef, Chicken or Fish, with a welcome drink. We then return to Boca Marina restaurant for our Desert, with a welcoming drink, or a coffee. There is an open bar on board Celine Charters and drinks included at each stop are rum punch, beer, wine and "well" drinks. As you might imagine, the party can continue way into the night. Book the Celine Charters Booze Cruise early. The Pubcrawl is yours for only $95 US and sails every Tuesday and Thursday evenings and starts at 6:30pm from the Boca marina, (boarding by 7:00pm) which is the old Uncle Harry's Restaurant, opposite the airport runway on the lagoon side. The hour and a half smooth and calm ride on the largest lagoon in the Caribbean will show you a unique view of St. Maarten, not possible by road . And for your enjoyment, Celine serves an open bar of rum punch, red or white wines, cold beer and soft drinks. While being refreshed from our open bar, we will circle the Lagoon and show you places of interest, Point Pirouette, Mullet Bay pond, the American University of the Caribbean and everybody's favorite, the houses of the rich and famous. This is a spectacular sight, so don't forget your camera. You will also be able to see some of the shipwrecks from past hurricanes and some of the island resorts from a whole different view. 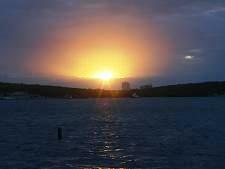 The sunset cruise is yours for $35 US and sets sail every Tuesday. It starts at 5:00pm at the Boca marina, which is the old Uncle Harry's Restaurant, opposite the airport runway on the lagoon side. 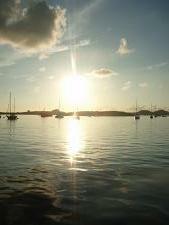 Return To St. Maarten's Sailing. 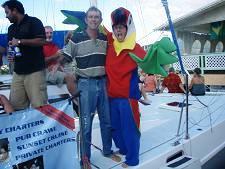 Return From Celine Charters To Discover-St.Maarten Home Page. Have your say about St Maarten! 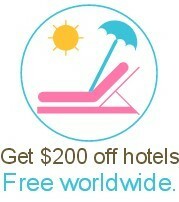 Tell your FB friends about this page in the box below. © Copyright 2006-2018 discover-saintmaarten.com All Rights Reserved Unlawful Duplication of material on this site is strictly Prohibited.